Single-family home sales growth across the Austin-Round Rock Metropolitan Statistical Area (MSA) was flat last month but did not impact strong year-to-date home sales numbers, according to data released today by the Austin Board of REALTORS® in its September 2018 Central Texas Housing Market Report. 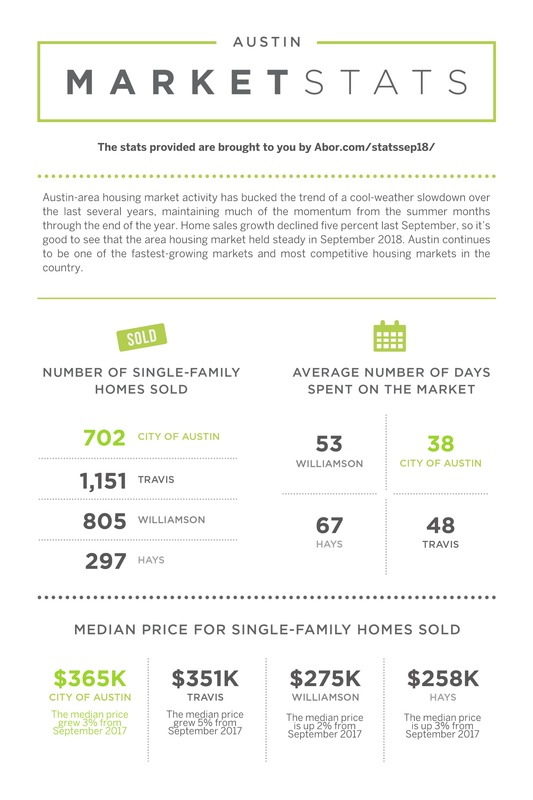 In Travis County, September single-family home sales slightly increased 1.7 percent year over year to 1,151 home sales; sales dollar volume increased 8.2 percent to $523,502,042. The median price for single-family homes rose 4.8 percent to $351,000. During the same period, new listings decreased 5.7 percent to 1,360 listings; active listings decreased 2.4 percent to 3,516 listings, and pending sales increased 5.1 percent to 1,162 pending sales. Monthly housing inventory decreased 0.2 months year over year to 2.8 months of inventory. This September, Williamson County single-family home sales decreased 9.1 percent to 805 home sales, while sales dollar volume decreased 4.2 percent to $251,413,411. During the same period, the median price for single-family homes increased 2.2 percent to $275,978. New listings increased 1.6 percent to 951 listings; active listings increased 11.8 percent to 2,685 listings, and pending sales decreased 2.2 percent to 805 pending sales. Housing inventory increased 0.2 months year over year to 3.0 months of inventory. Hays County single-family home sales rose 10.8 percent to 297 sales in September, as sales dollar volume experienced a double-digit increase of 16.3 percent to $101,038,355. The median price for single-family homes increased 3.4 percent to $258,500. During the same period, new listings rose 3.6 percent to 343 listings; active listings increased 9.9 percent to 1,043 listings; pending sales increased 4.4 percent to 283 pending sales. Housing inventory increased 0.1 months to 3.5 months of inventory.